A bookstore is only as good as its community of readers. We open to all requests for donations from organizations in the Okemo Valley area as well as literacy groups and libraries across the State of Vermont. We don’t guarantee that we will support everything, but we will at least take a look at the request. 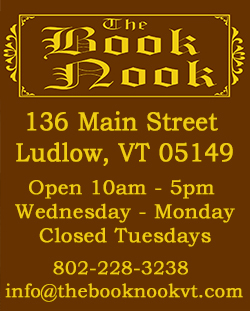 Please send email to scott@thebooknookvt.com for requests or stop in the store. We also donate copies of advanced reader copy books and received damaged books to qualifying organizations (such as libraries and prisons). Please send email to scott@thebooknookvt.com if you would have like to receive books for donation. For local organizations, we also make our store available as a meeting place as we can accommodate with our operating hours.